This practical and inspirational guide, in a handy sketchbook format, is aimed at the practised beginner and shows how to paint successful flowers in watercolours in just 30 minutes - ideal for the busy amateur artist. Many people think they don't have enough time to paint, but in this attractive guide Trevor Waugh encourages quick and simple learning. By working with just a few materials and focusing on just the key techniques it is possible to achieve successful, delicate paintings of flowers in no more than half an hour. And for those artists who already have a little painting experience, learning to work more quickly enables them to free up their style and paint more spontaneously. 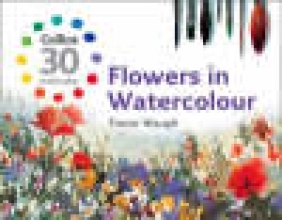 All the key topics are covered, from watercolour techniques, colour and tone to learning about flower shapes, foliage, patterns and textures. There are also practical projects and step-by-step demonstrations as well as helpful tips and checklists.